The Bombardier CRJ200 ER is the "extended range" version of the Bombardier CRJ200. The Bombardier CRJ200 ER is one of the two CRJ200 versions. 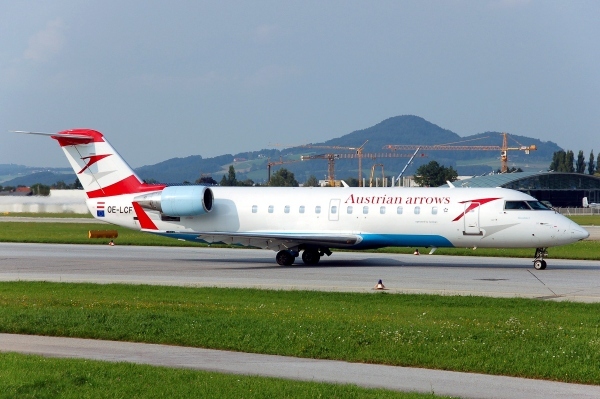 The Bombardier CRJ200 ER is not the longest range CRJ200 available. The Bombardier CRJ200 LR (long range) is the longest range capable CRJ200. A CRJ200 ER is one of the most common Bombardier CRJ200s flown today. The main difference between the CRJ200 LR and the Bombardier CRJ200 ER is range and performance enhancements. Bombardier CRJ200 ER Range: 1,345 Nautical Miles, 1,548 Statute Miles or 2,491 kilometers. The Bombardier CRJ200 ER is also known as the Bombardier CRJ-200 ER, Bombardier CRJ 200 ER, Canadair CRJ200 ER, CRJ200 ER aircraft and the Bombardier CL-600-2B19 ER. Above Bombardier CRJ200 ER photo from Wikimedia Commons. Photo (only) is released under a Public Domain license.